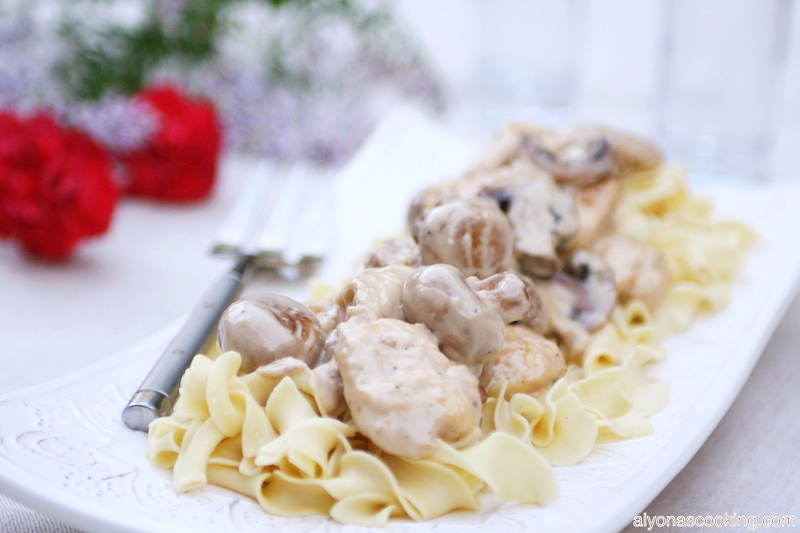 This Creamy Chicken & Mushroom Sauce is so good! 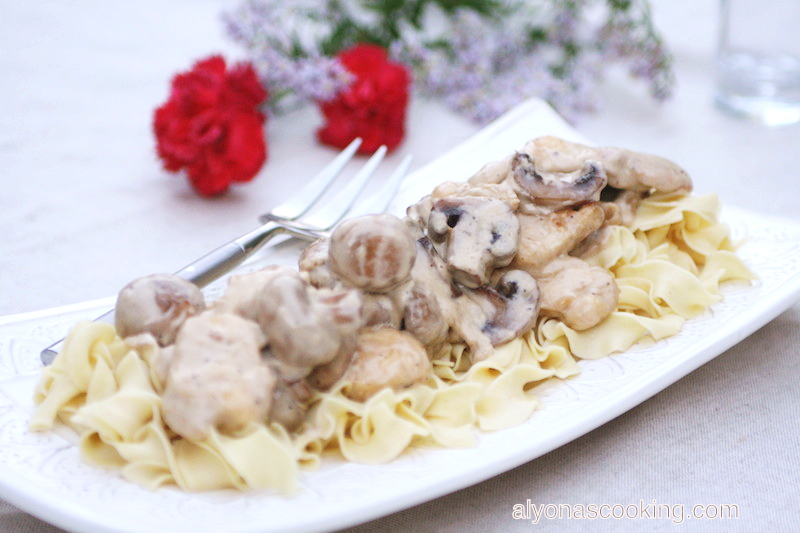 Floured chicken and sautéed plump mushrooms are smothered in a creamy sauce and topped over egg noodles. This easy stove top method requires one frying pan (less mess) and is done fairly quickly. 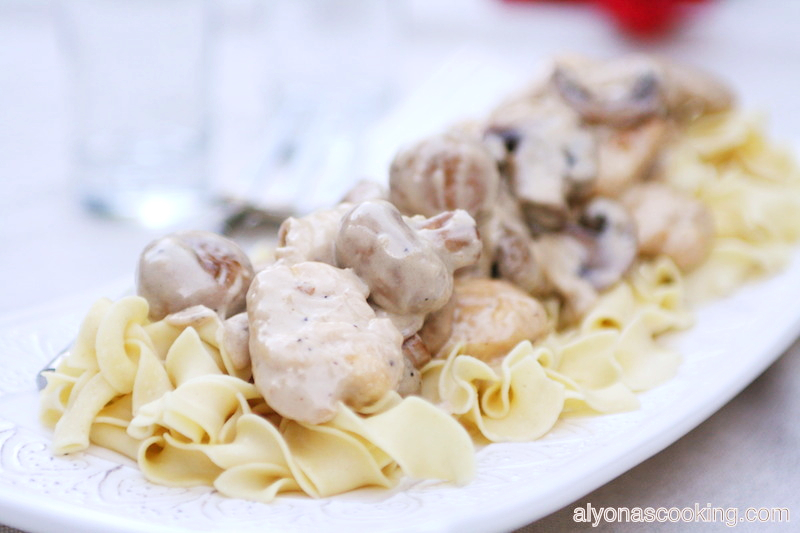 A mixture of two creams (heavy & sour cream) are combined for a very tasty and satisfying meal. 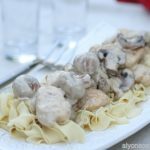 I really prefer using whole mushrooms, because when you bite into one, you can actually taste the juice of the mushroom bursting in your mouth. This one pan meal is simple and really, really good! You can probably eat the sauce alone (it’s really that good) but I served this over 1/2 lb of egg noodles. This is kind of like a sauce or gravy so you can be very creative with what you want to serve this with. Enjoy! Wash and dry your mushrooms with paper towels. Heat a large shallow frying pan over medium high heat. Add two tbsp of oil and sauté the mushrooms for about 10 min reducing the tempter after they have slightly browned. Meanwhile slightly flatten the chicken breast by pounding meat in a ziplock bag; remove and thinly slice. In a large zip loc bag combine the flour, salt and pepper and toss to combine. Place chicken pieces in bag and shake to coat all pieces evenly. Reserve 1 tbsp of the excess flour as we will be using some of that flour for our sauce. 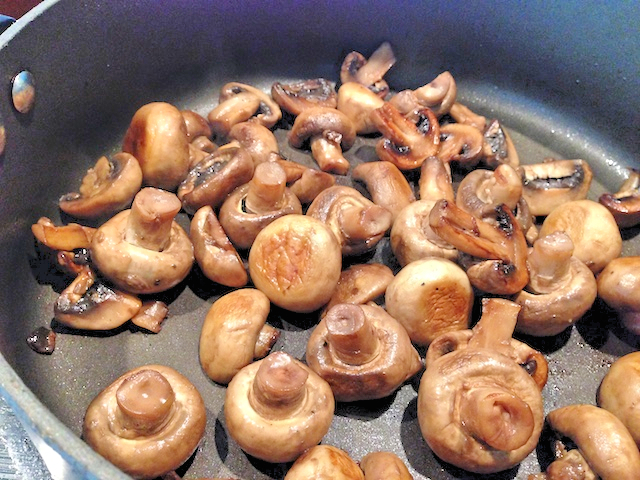 When mushrooms have browned nicely and shrunk much in size (about 8-10 min) remove from pan and place into a heat-proof bowl. Melt 2 tbsp of butter and 2 tbsp of oil over medium heat. Add the floured chicken pieces to the butter and fry on each side for about 2 min. Remove chicken pieces and set aside. Reduce the heat to medium-low. You should have some butter/oil remaining in your frying pan after you have fried the chicken. Add 1 tbsp of the seasoned flour that you used to flour your chicken pieces to the frying pan. Stir with a wooden spoon until incorporated into the oil. Then add half of the cream, whisking until smooth. Add 1/4 cup of sour cream and whisk. Sauce should be bubbly and smooth. (This prevents lumps.) Add the remaining cream, 1 tsp of vinegar, 1 bay leaf, 1/4 tsp salt and 1/4 tsp ground black pepper. Simmer over low heat for a minute or so and then add the chicken pieces and mushrooms; heat through. Remove and keep warm until you serve. Wash and dry your mushrooms with paper towels. Heat a large shallow frying pan over medium high heat. 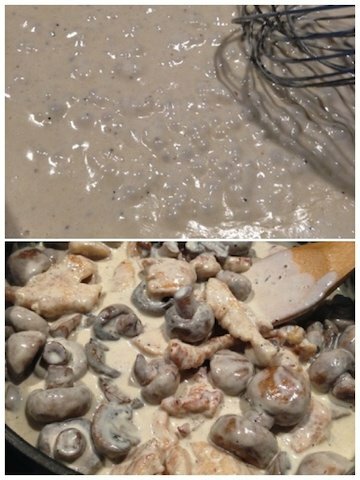 Add two tbsp of oil and sauté the mushrooms for about 10 min, reducing the temperature after they have slightly browned. Season very lightly with salt and pepper. When done transfer mushrooms to a bowl. 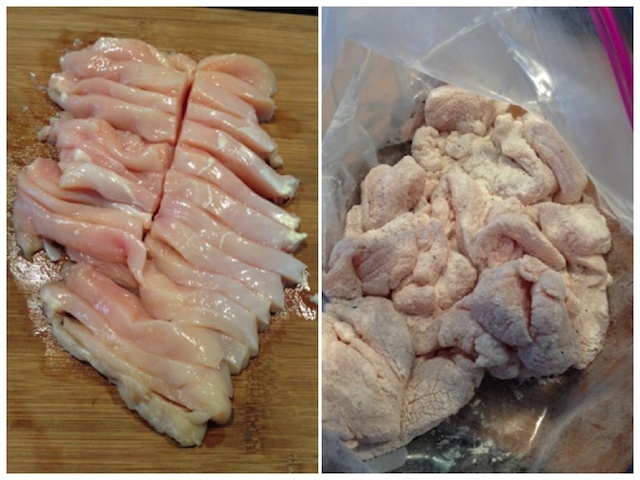 Meanwhile slightly flatten the chicken breast by pounding meat in a ziplock bag; remove and thinly slice. In a large zip loc bag combine the flour, salt and pepper and toss to combine. 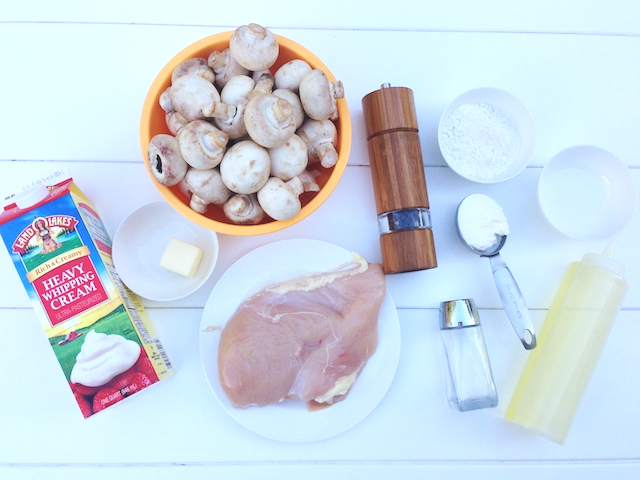 Place chicken pieces in bag and shake to coat all pieces evenly. Reserve 1 tbsp of the excess flour as we will be using some of that flour for our sauce. Melt 2 tbsp of butter and 2 tbsp of oil over medium heat. Add the floured chicken pieces to the butter and fry on each side for about 2 min. Remove chicken pieces and set aside. Reduce the heat to medium-low. 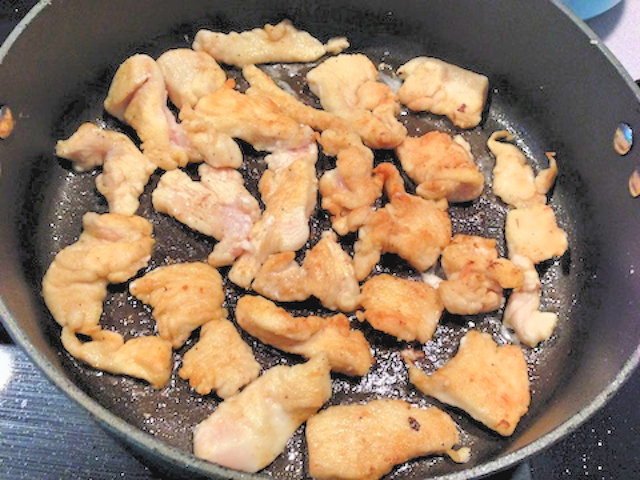 Add 1 tbsp of the seasoned flour (that you used to flour your chicken pieces) to the frying pan. Stir with a wooden spoon until incorporated into the oil. Then add half of the cream, whisking until smooth. Add 1/4 cup of sour cream and whisk. Sauce should be bubbly and smooth. Add the remaining cream, 1 tsp of vinegar, 1 bay leaf, 1/4 tsp salt and 1/4 tsp ground black pepper. This prevents lumps. Simmer over low heat for a minute or so and then add the chicken pieces and mushrooms; heat through. Remove and keep warm until you serve. Thank you. It tastes delicious.